FIRST EDITION SABET X L.TYPE GICLEÉS ACCOMPANIED WITIH A HAND SIGNED CERTIFICATE OF AUTHENTICITY AND ORIGINAL SABET SKETCH. This unique painting is one of the 200 paintings created for the Wild & Free Collection. This series is a collection of signed giclee’s made by L-type for Sabet. Each Gicleé is accompanied by a hand signed certificate of authenticity that will include an original sketch for you. So you’re actually getting 2 original pieces with this purchase. L.Type produce the world’s only 400ppi ultra-high-quality silver halide prints, available as individual prints, portfolios and photobooks. Having designed and built their own printers from scratch, L.Type apply 21st century digital technology to expose traditional silver halide (‘C-Type’) paper to a previously unachievable level of accuracy. Printing at 400 pixels per inch, L.Type can reveal all the detail that a young human eye can see at arm’s length. 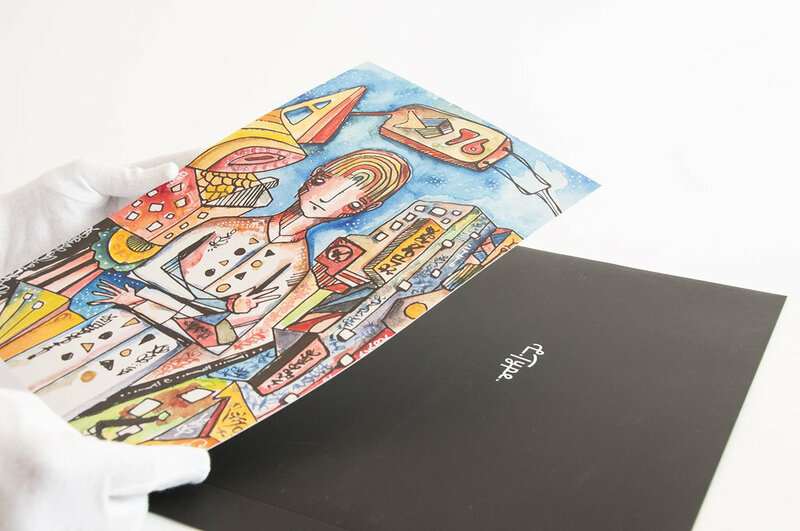 Presentation is key to the L.Type experience too – L.Type prints are beautifully packaged and can be presented in an exclusive portfolio box for maximum impact. Every print is hand-trimmed and individually checked to make sure you get the very best.